Adanac Industries, Inc. (“Adanac”) is a niche CNC machining operation that produces close tolerance and high precision components utilizing exotic metals in critical applications for the aerospace and defense markets. MelCap Partners acted as the sell-side advisor to Adanac Industries. 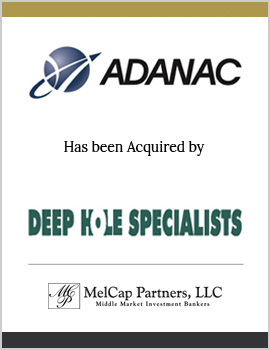 Adanac was successfully sold to Deep Hole Specialists, a strategic buyer located in Chagrin Falls, Ohio.